Students are introduced to families (groups) within the periodic table that have the same number of electrons in their outer energy orbitals. Tests are conducted to determine if those elements have similar chemical activity. 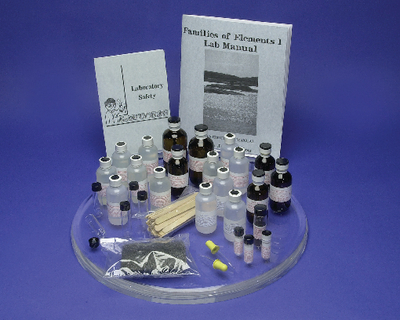 This kit includes two experiments, one in which students determine the reactivity of the nonmetals in the halogen family and one in which they observe the properties of oxygen. Worksheets focus on identifying characteristics of elements within the halogen, oxygen and nitrogen families, separation methods, and the observed chemical reactions. Materials Needed But Not Included: chemical ventilation hood, general lab supplies. Includes nitric acid.